"How should I adjust my interior lights at night so I can read charts while preserving my night vision?" 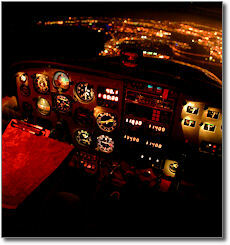 -Gary R.
"Using the proper lighting can be a big help to the pilot in preserving night vision. The best way to use your interior lighting is to reduce it to a minimum. At night, this may require reducing the lighting progressively after engine start to give your vision time to adjust to the darkness. Be aware that this may take 15 minutes or more and plan accordingly. Of course, doing this requires that you be familiar with the interior lighting controls for your aircraft and the types of lighting you can adjust. Frequently there are multiple controls for the various components of interior lighting such as instrument backlighting, post lighting, map lighting and floodlighting. Some aircraft also have red filters which can be slid over some of the lights to help enhance night vision. 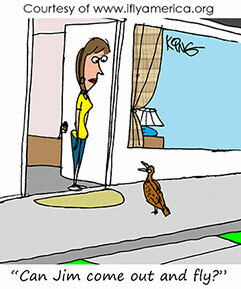 Since red light helps preserve night vision, having a flashlight with a red lens is best. Many mini-flashlights can be purchased with red lenses, and other flashlights have clear and red lenses that can be swapped for day and night use. The red lenses work best at night because red light is less disruptive to night vision than white light."